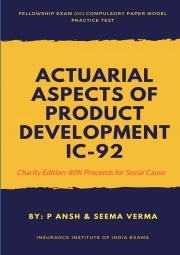 Description of "Fellowship Exam (III) IC 92 Actuarial Aspects of Product Development"
Insurance Institute of India Compulsory Paper IC 92 Actuarial Aspects of Product Development Model Practice Test. This book is specially developed in focused with mathematical questions which will help you in preparing your exam in an effective way. This publication is a charitable edition and 80% of proceeds will go to a social cause. The book consists of three model practice test with 100 practice questions each set, along with concept building on time value of money as an addition for your preparation. Ansh, a Certified Financial Planner, a passionate Six-Sigma Certified corporate trainer, driven by an objective to achieve & empower financial inclusion through quality education with a fundamental principle of “Earn living hood by serving”. Equipped with over half a decades of national & international financial industry experience specialized in area of operation, training & Content development. Numerous contributions have been made by him in the field being associated with world renowned organization, NGOs, Educational Institute & Consultants. Also serving as visiting Faculty to various financial academic institution & Hon Global Advisor: American Academy of Financial Management® Presidential Board, AAFM® Board of Standards. As person an extra observant & curious independent Business Consultant, delivering accountability and process excellence with proven track of class room delivery. He also devote his time in helping & motivating students academically as pro-bono basis. Seema, A competent professional equipped with 12+ years of Financial Industry expertise. A prolific financial coach & successful corporate trainer in finance specialized in area of Time Value of Money, Accounts, Costing, Taxation and Insurance Accounting. For the past ten years she has studied the monetary system, functioning of different financial examining bodies, regulatory framework of BFSI domain and helping students in their exam preparation for various financial certification examinations. Reviews of "Fellowship Exam (III) IC 92 Actuarial Aspects of Product Development"